Average number of viewers for NBA games on TNT this year, its highest-rated, most-viewed NBA season ever: 2,498,000. Corresponding percentage jump from last year: 4. Average number of viewers for NBA games on ABC this year, its highest-rated, most-viewed NBA season ever: 5,421,000. Corresponding percentage jump from last year: 6. Average number of viewers for NBA games on NBA TV, its highest-rated, most-viewed NBA season ever: 337,000. Corresponding percentage jump from last year: 33. Average number of viewers for the games in the first round of the NHL playoffs on NBC, NBC Sports Network, and CNBC, making them the most-watched first round of NHL playoffs on record: 929,000. Average number of viewers of the first night of the NFL draft on ESPN: 6.66 million. Average number of viewers of the first night of the NFL draft on ESPN and the NFL Network combined: 8.1 million. Number of TV series that registered all-time ratings lows that night: 7. Amount NBC is spending on current sports rights agreements: $15 billion. Cost of the overall Miami Marlins stadium development: $634 million. Cost of the stadium itself: $515 million. Amount the Marlins contributed to that: $120 million. Percentage of Miami-Dade County voters who opted to oust Mayor Carlos Alvarez last year in a recall election partly because of the amount of public money used to build the new baseball stadium during a difficult economy: 88. Number of games Marlins manager Ozzie Guillen was suspended in April for making pro–Fidel Castro comments to Time magazine: 5. Number of protesters around the ballpark the day Guillen’s suspension was announced, according to ESPN’s Wright Thompson: fewer than 200. 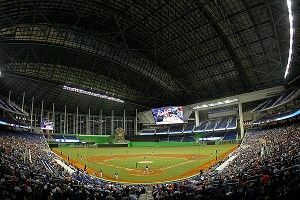 Average attendance at Marlins games last year: 19,007. Average attendance at Marlins games so far this year: 30,648. Capacity of their new stadium: 37,442. Crowd at Ohio State’s spring football intrasquad scrimmage: 81,112. Crowd at Alabama’s spring football intrasquad scrimmage: 78,526. Estimated crowd at Penn State’s spring football intrasquad scrimmage: 60,000. Amount Penn State has paid “at least” 12 public relations firms in the wake of the Jerry Sandusky scandal: $7.6 million. Number of national journalism awards, including a Pulitzer, won by crime reporter Sara Ganim of the Patriot-News of Harrisburg, Pa., for her coverage of the scandal: 5. Years since a sports writer has won a Pulitzer: 12. Number of sophomore starters on Kentucky’s national championship basketball team this year: 2. Number of freshman starters: 3. Number of those starters who decided to leave UK early to go to the NBA: 5. Games played in Jeremy Lin’s NBA career: 64. Points averaged in those games: 9.2. Games he’s played in the past month: 0. NBA rank in individual jersey sales: 2. Kobe Bryant’s jersey rank: 3. LeBron James’s jersey rank: 4. Number of homers (as of Monday night) hit this season by Albert Pujols: 0.